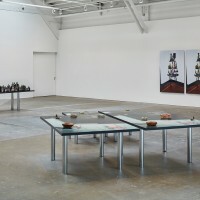 Installation view (detail) of Yuki Kimura’s mixed-media installation titled Inhuman Transformation of New Year’s Decoration, Obsolete Conception or 2 at CCA Wattis Institute of Contemporary Arts; courtesy the artist and Taka Ishii Gallery; photo: Johnna Arnold. 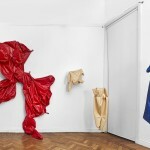 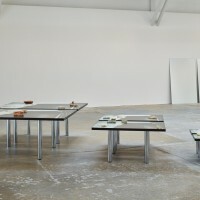 The installation practice of Yuki Kimura (b. 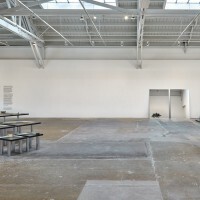 1971 in Kyoto; based in Berlin) borrows from architecture, design, photography, and sculpture to make the immaterial material. 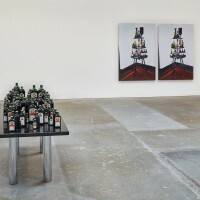 She often incorporates found photographs in her work as sculptural objects, combining appropriated imagery with other found and constructed objects or furniture to create mixed-media sculptures. 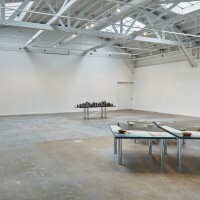 For Kimura’s Wattis Institute show, Yuki Kimura: Inhuman Transformation of New Year’s Decoration, Obsolete Conception or 2 —the artist’s first commissioned solo exhibition at a US institution— she produced several new works that reflect on doubling and repetition, which also continue her interest in photography’s objecthood and connection to time. 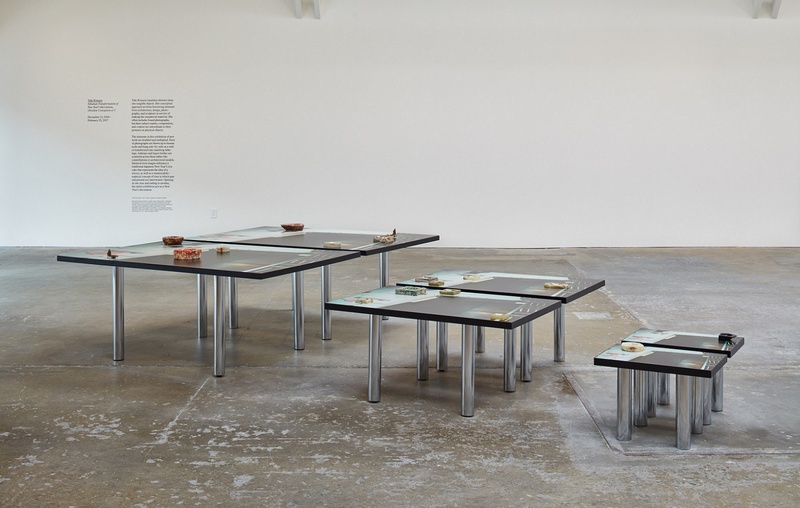 The exhibition is co-curated by Wattis Institute associate curator Leila Grothe and head of publications Jeanne Gerrity and includes an exhibition brochure featuring an original essay. 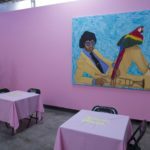 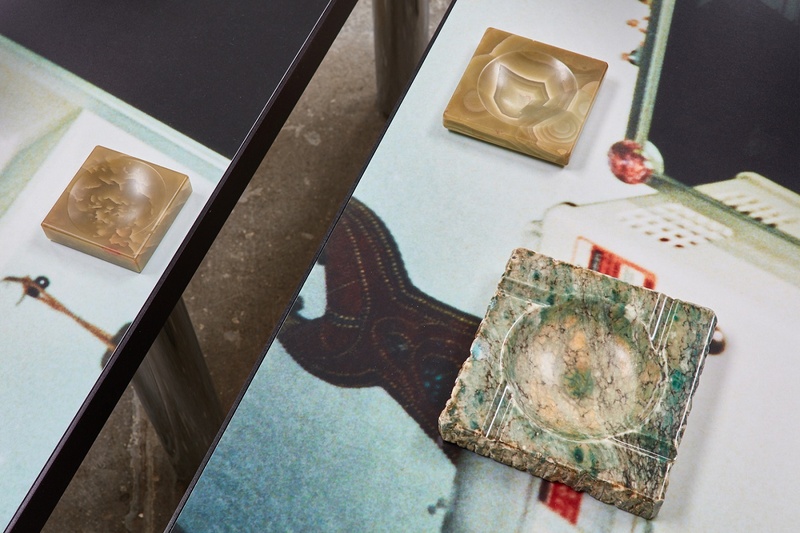 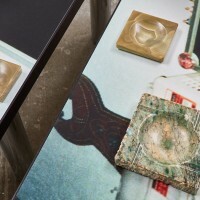 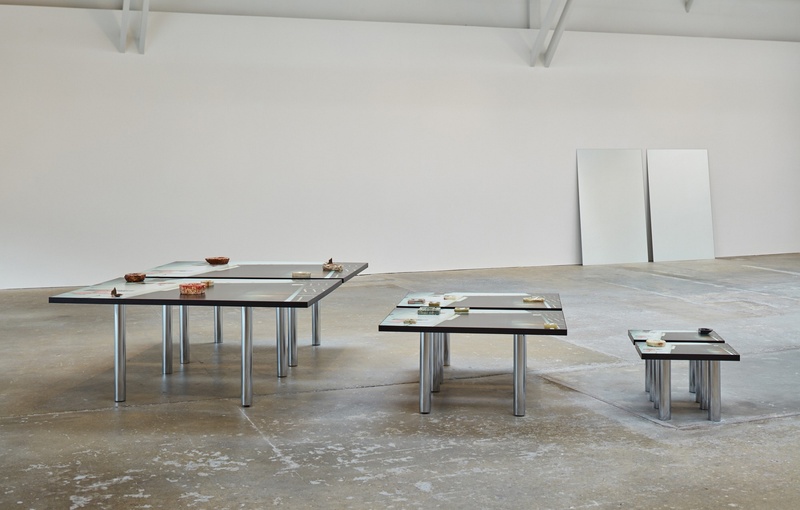 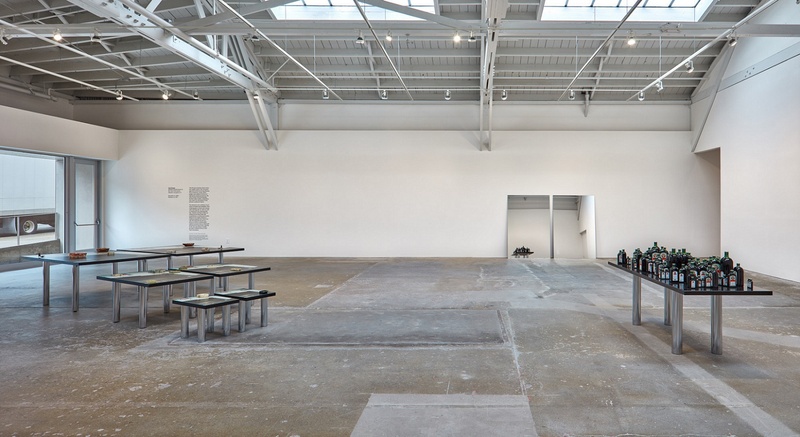 The largest sculptural work in the exhibition, Table Stella (2016), comprises pairs of tables in three different sizes with a version of the same found photograph printed on the surface of each tabletop. 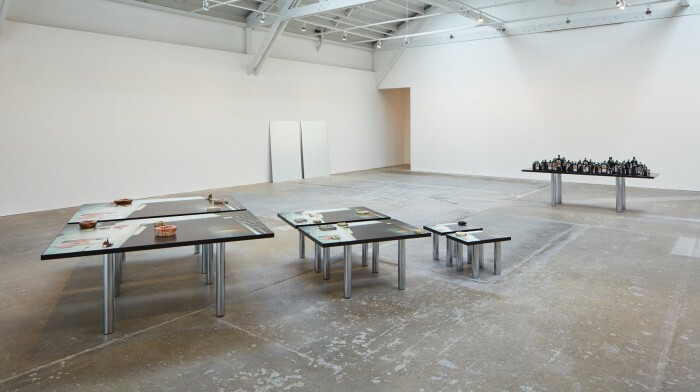 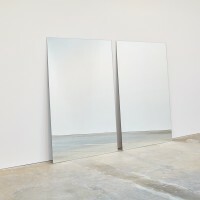 The appropriated image depicts a room interior that’s murky and unidentifiable, although in it a mirror reflecting a window can be seen resting against a wall. 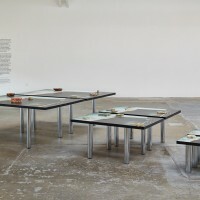 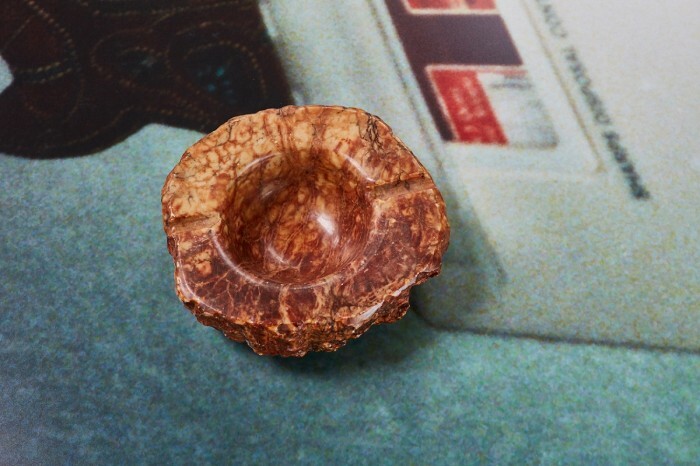 Placed on the tables are ashtrays that, like the use of analogue photography in Kimura’s visual vocabulary, suggest obsolescence —markers of a recent yet bygone era rendered unnecessary by e-cigarettes or simply no longer in fashion. 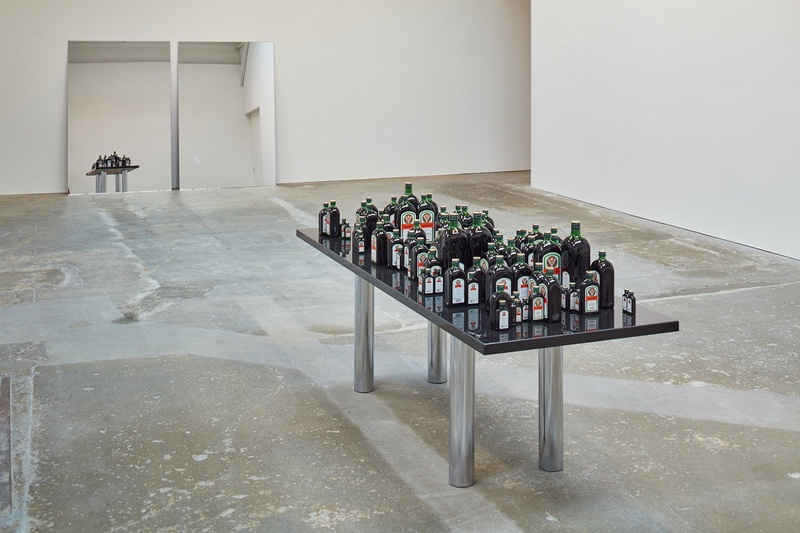 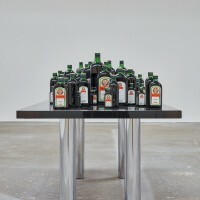 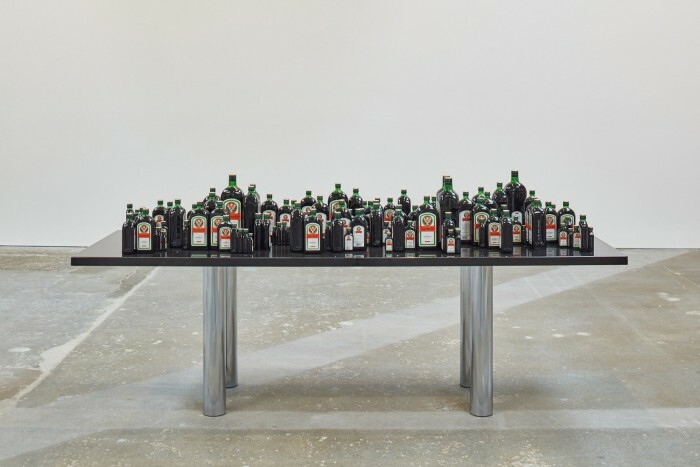 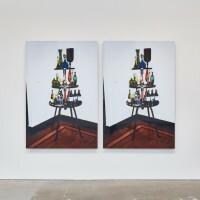 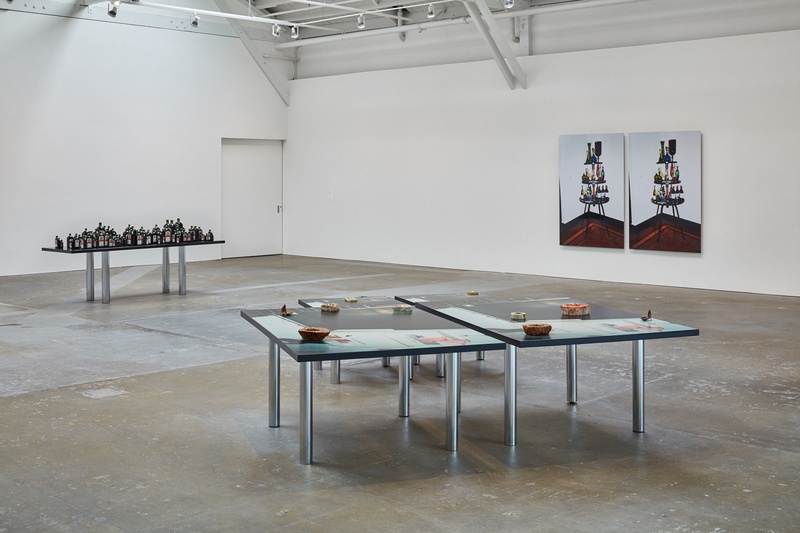 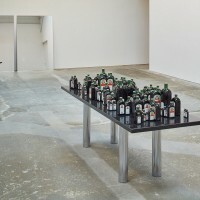 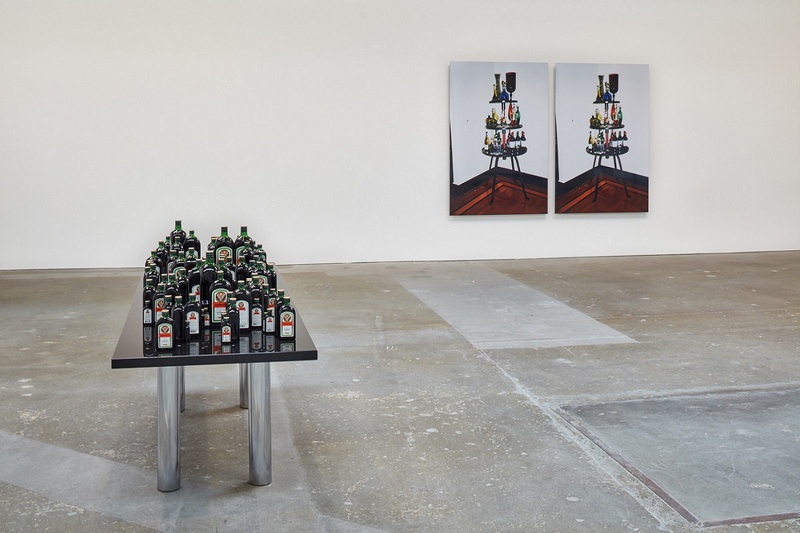 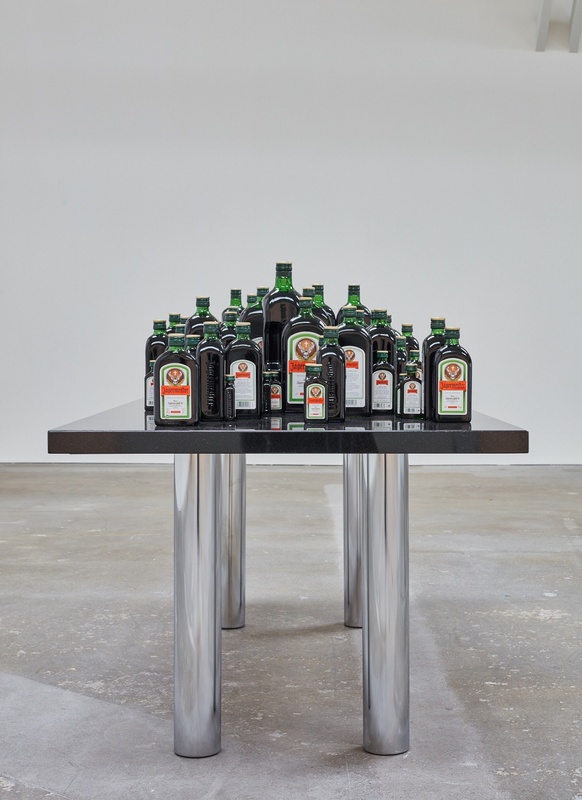 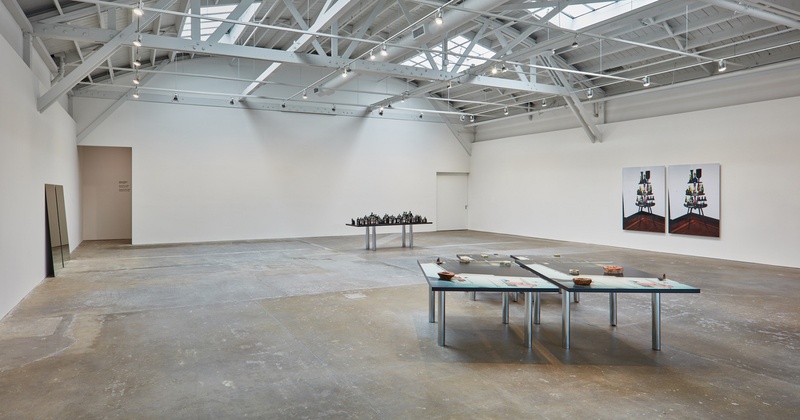 On the glossy, black surface of another table is a collection of Jägermeister liquor bottles in different sizes that allude to Kimura’s interest in western philosophical concepts of multiplicity. 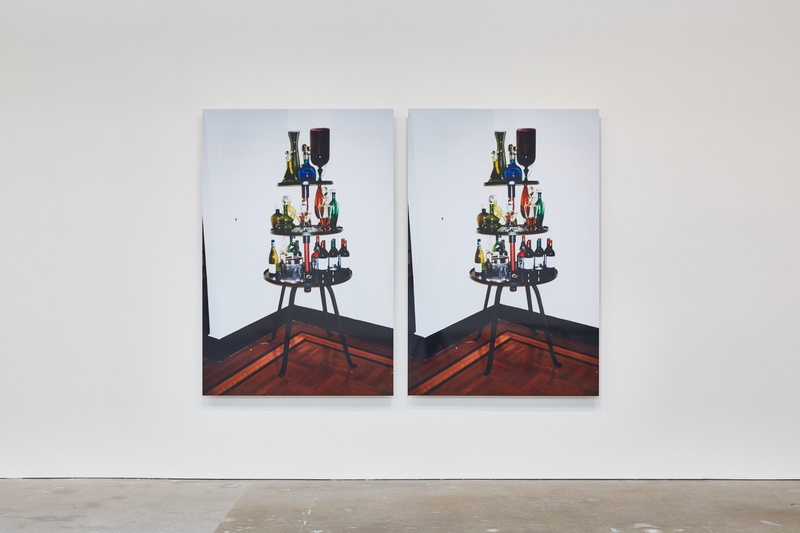 Other exhibition elements include pairs of wall-mounted images —found photographs that have been digitized and reprinted on a large scale— and dual mirrors that further the doubling effects and reflect other works in the gallery and its visitors. 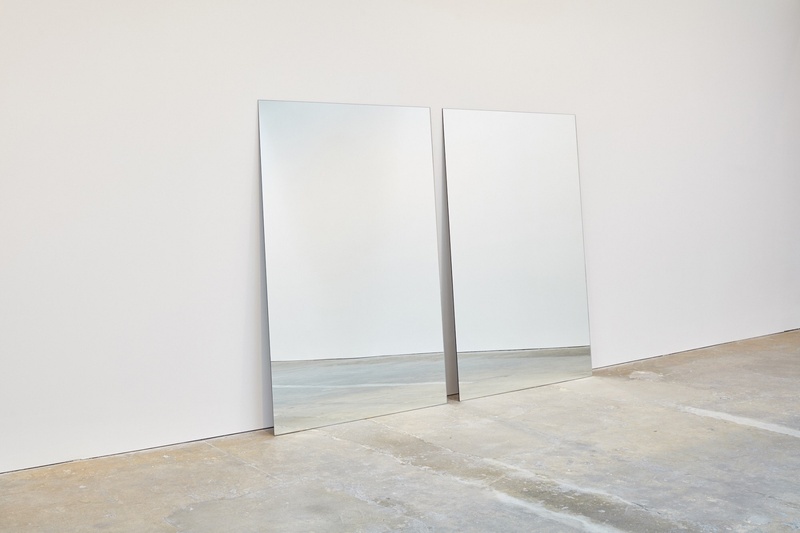 The twin images reference a traditional Japanese New Year’s decoration that symbolizes the idea of a mirror as well as the conflation of past and present.